I’ll admit that I was one of the Lunar’s early detractors. There is no doubt that this is a polarizing camera; it won’t be everybody’s cup of tea. Many were left questioning Hasselblad’s decision to effectively rebody a Sony NEX-7 – in itself a competent camera – but it was likely the price and design direction that really created a bit of a tempest. There’s no question that the Leica-reshelled Panasonics do look better; the design is cleaner and less fussy. And the premium is partially explained by the extended warranty and inclusion of Lightroom with your purchase. This isn’t the case with the Lunar/NEX-7 – the price difference is several multiples, almost certainly due to the choice of materials. Yesterday I met with the MD of Hasselblad’s Asia Pacific distributors, Egon Heldner of Shriro. He had with him a Lunar prototype; at some point during the conversation – initially about Zeiss – the camera magically appeared in his hands. I got to play with it a little (but not make test shots) and have a conversation to try to understand exactly what they were thinking when they decided to push the collective go button on the project. Please note that this camera is an engineering prototype, which means that electronics, fit and finish (and even some aspects of design) are not final. It was working, however, and felt remarkably well put-together for a prototype – though unfinished in some areas. Secondly, none of the photos or press images I’ve seen do the camera justice. 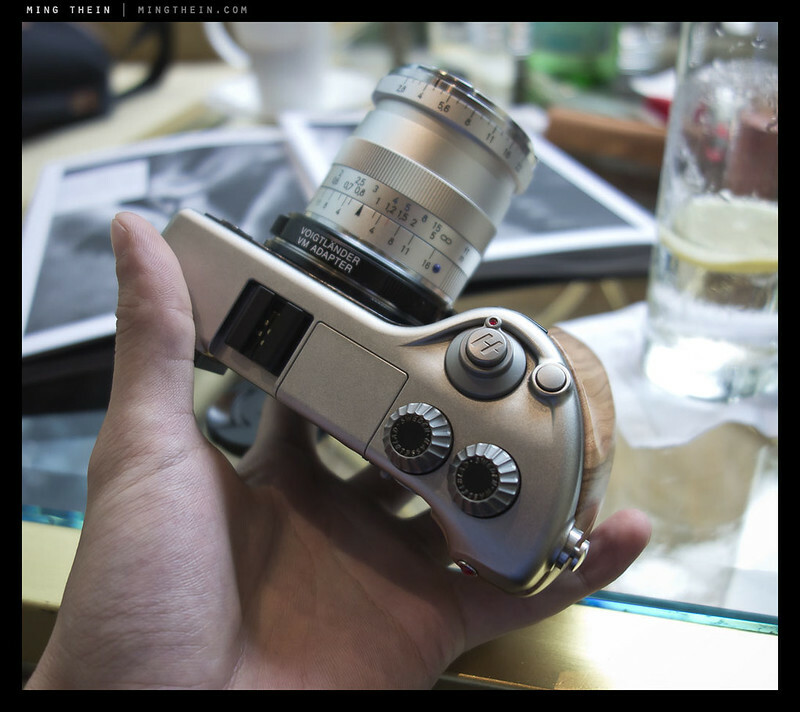 In the metal, I won’t say it’s minimalist beautiful in the way a Leica M is, but it certainly isn’t ugly. The odd orthogonal projection for the original drawings didn’t have any sense of perspective and overemphasized the size of the grip (I do consciously think about these things, because I am a product photographer). The big surprise for me was the way it felt in the hand – it has an ergonomic ‘rightness’ to it that most cameras lack, including the original NEX-7. The grip shape is surprisingly very comfortable, and for the most part, the choice of materials is excellent. I still think the rubies are utterly pointless, and I’m undecided about the carbon fiber front plate, but the titanium top deck is utterly gorgeous. And I don’t mind the wood either, to be quite honest. As much as I like the idea of blue leather, I suspect that it’s going to be utterly impractical; I live in the tropics and cameras getting wet from rain or sweat is inevitable. Hasselblad’s designer got one thing absolutely spot on: the tactility of the object. If you spend a large number of hours every day with camera in hand, you don’t take these things for granted; the weight (yes, something can be too light); the way the controls feel in terms of dial/ button resistance etc. ; the grip shape, etc. are all very, very important. It’s one of the reasons why I’m not bonding with the D600: it’s not the image quality or functionality, it’s the angular feel of the grip that just doesn’t make you want to hold it for very long. As a result, I don’t use it. Again: it’s not for everybody; a lot of people think it’s a) ugly and b) pointlessly overpriced. Yet some will buy it because it’s a ‘Blad/ status symbol. I wouldn’t not buy it because it’s a rebodied Sony; the original could definitely use some improvements in the tactility department. But I’ll say two things: firstly, I strongly encourage people to pick one up and feel it before making a judgement. Secondly, it’s not going to be as expensive as expected. Here’s an interesting thought about publicity – they say any form of it is good – at the release of most modern DSLRs/ enthusiast compacts, on forums you’ll get a whole bunch of people saying ‘I’ve preordered’, a number saying ‘if only it had XYZ’, and others saying it’s pointless. Let’s ignore the usual silent majority. With the Lunar, I think there were 500+ comments on the DPReview announcement page within a day; about 70-80% were negative. Yet there were 20% who liked the camera – given that something of this price is an emotional purchase, generally buyers tend to fall into one of two camps: you either like it, or you don’t. Sadly, most of their buyers won’t be pros or serious photographers – though that doesn’t stop them from making it a serious photographic tool. I don’t think Hasselblad will sell many of these as body-only outfits; most buyers won’t have lenses, and the obvious choice for bundling would be the new Zeiss AF series. And even if Hasselblad sells 100 of these things off the mark, that will represent a significant chunk of change. I’m sure the actual number is much higher – there are apparently quite a number of pre-orders in Malaysia already – given that their target clientele generally don’t frequent forums. The difference here is whilst a lot of people on forums will coo over a D4 or 1Dx, most will not buy one for various reasons. At the other end of the market – and I know this from being involved in the high end watch business – a very different dynamic is at play. 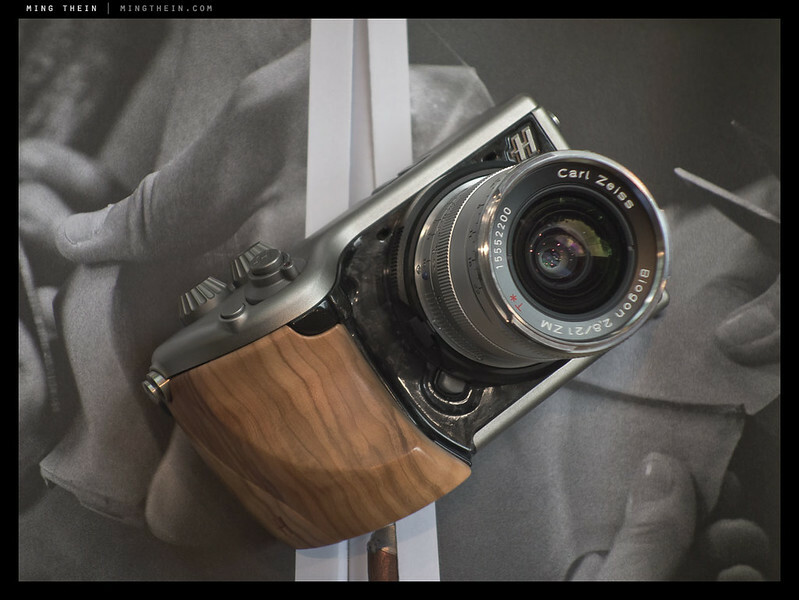 As much as this camera is really a NEX-7 rebodied, it could be much more. Sony have already confirmed that the E mount is large enough to accept a full frame sensor; what if Hasselblad were to put a D800E sensor in it, default to DX mode when using the regular E mount/ lenses, and then include an F-E adaptor to allow the use of ZF.2 lenses? That would certainly be a very interesting option, and would at a stroke solve the shutter vibration issue. I’d definitely like to see a conventional hotshoe, though. Again, there’s a watchmaking analogy here: a lot of very high end watches use pedestrian base movements; whilst some of them really don’t do anything with a $200 movement other than put it in a case, slap a brand on it, then add a couple of zeroes at the end, there are others who consciously select the pedestrian tractor as a base to develop off because it is a) reliable and proven; b) easy to service; c) has the properties required to support complications; and c) frees up limited development funds that would otherwise have been spent on the base movement to be used in other parts of the watch. I’m sure you can see the parallel here. Here’s the thought that’s been nagging at me all of this time: if you ignore the design, price etc – the positive vibe about the NEX-7 at launch was incredible. If that had been launched at the same time with a series of AF Zeiss lenses and supplied in sufficient quantity, I think Sony could have well gotten the jump on M4/3 – at least in the high end market. We have that happening now with the Lunar – yet just because it’s been rebodied doesn’t make it any less capable a photographic tool than the original camera was. Is it four, five times better like the price suggests it should be? No, but then again neither are any of the $5,000 cameras (except perhaps the D800E). Take a D4 or M9-P for example: with the former, you gain speed, high ISO capability, ergonomics and AF, but less resolution and considerably greater bulk. It’s not five times faster, nor does it shoot ISO6400 like the NEX-7’s 1600. With the latter, resolution is probably about the same given the lack of an AA filter, but it’s much, much slower, a poorer performer at high ISO, and nowhere near as reliable. Yet it doesn’t stop Leica selling in impressive numbers. I’d be curious to hear your thoughts and open this up to a general discussion – please leave a comment below. Thanks! Hi Ming, nice review. Sorry about the abuse you have had to get over this. Personally I reckon that if Idon’t like or agree with what someone has said then I just shrug and go “oh well, that’s not how I see it”. If you disagree, then why plagiarise? No penalty for having your own point of view. its not plagiarism, but as the basis for a discussion. Based on your point I will then submit my point of view on the camera topic. That is not plagiarism. Plagiarism is when I take your point and present it as my own. Like the Ferrari skinned H4D, the Lunar is a stark reminder that all things must pass, even once great institutions. To me, this latest offering is physical proof that Hasselblad is displaying it’s final, ugly death rattle. Ugly but comfortable – kind of like my Birkenstock sandals! Ming, thanks for helping me get my head around this topic. (Your writing often seems to have that effect.) The high-end watch analogy and parallels with Panasonic & Leica are angles I had not considered. With its ability to work with old manual focus lenses so effectively, NEX-7 has rekindled my enthusiasm for photography in ways the DSLR w/ walkabout zoom never quite did. 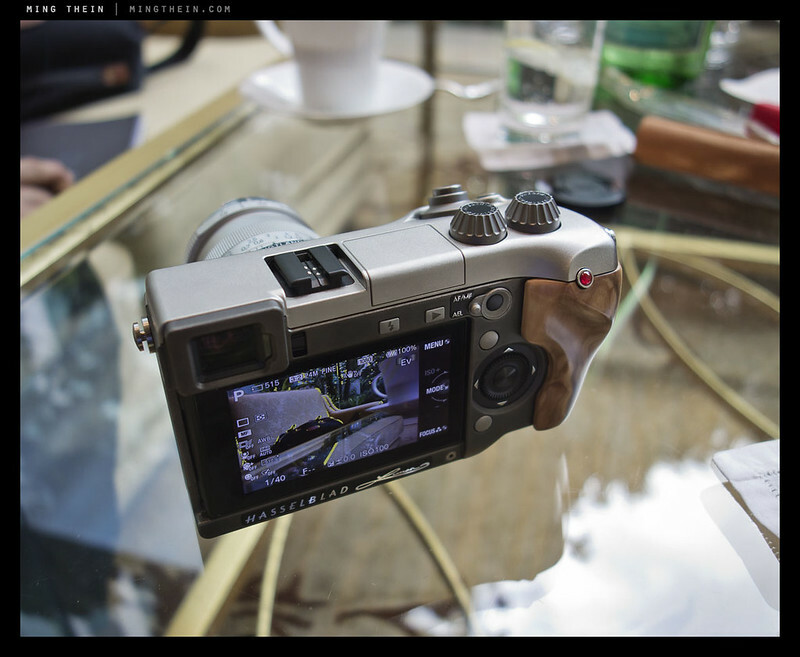 I’m a huge fan of the NEX-7, though I understand it may not be ideally suited to most full-time pros’ needs. I will probably never buy this Hasselblad, but it is a development I welcome. Addressing ergonomics, spurring development of more high quality native lenses & bolstering the appeal of e-mount to enthusiasts & pros, these are all good things as far as I’m concerned. No problem, Jeff. Doubtful I will buy one either – I’m happy with M4/3 and the lenses I already have – but like you I think it represents an interesting first step in the camera industry. As for the battery…it looked like a standard NEX7 battery to me. Err…that’s not a simple question. Can you be more specific? 1. High end is defined on price and perceived exclusivity. These days…$10k and up, I think. 2. What the buyers want is different usually from client shoot requirements. I’ve been trying to tell them this because I’ve been on both sides of the fence, but nobody listens to me. All I can do is slip in one or two of my own and hope they make it into the final release (they never do). Did you heard something about Zeiss producing autofocus lenses ? Yes, there was an announcement at Photokina for E and X mount AF lenses – 12, 30 and 60mm I believe. Ming, I am a daily visitor of your site and never understand, how you can do all this in 24h per day!! I am a glad owner of the M9 and of one of the very first Monochromes 🙂 And I have a Nex7 and used the Leica glass on it. As my eyes are very bad, I like the focus peeking of the Nex/7 (and hopefully the Leica M) or I use the AF lenses for the Nex7, the Zeiss 24/1.8 and the very cheep Sony 50/1.8. I printed portraits from the Sony 50/1.8 on A2 (40x60cm) with super results. I am expecting the new Zeiss 50 macro next year. Do you mean the 55 Distagon? It’s not a macro lens. But yes, I think given time the DSLR might be going the way of the dodo. Once EVFs improve a bit more, and sensors start to include phase detect AF sites, it’s all but game over. no, I did not mean the 55 Distagon. This is what you mentioned below, I guess. BTW: there is the great Zeiss 24mm/1.8 with AF and full support for all Nex functions! It is my favorite lens most of the time. Yes, those are the lenses I meant. Sadly no 28mm equivalent, yet. Ming, Hasselblad has blatently targeted this object to people who value luxury branding more than photographic function and design integrity. Seems to me the larger story is why Hasselblad would do this – what does it say about the management of the company, it’s strategic philosophy, future direction, etc. That would be the really interesting story. As an analogy: If Aston Martin or Maserati or Ferrari wrapped a Toyoto in uncharacteristic bling we’d be less interested in how the car performed and more interested in figuring out what the heck they were thinking. Most of the folks at Hasselblad are probably recoiling in horror – it would be fascinating to know who’s driving this product strategy – and how long they’re going to last. Aston Martin DID wrap a Toyota IQ in an Aston body, call it a Cygnet and then sell it at a silly price. Something to do with company average CO2 or something. They actually sold a surprising number of them. As to what they’re thinking – or the new management – that’s easy. The new owners are a PE fund. It’s all about return, not long term growth. But to have short term return, you need a cheaper, faster moving product; hence the Lunar. The MF camera market isn’t at all fast moving. And even if you wanted to really shake the boat, you need the cash for R&D to do so. Presumably – one can only hope, if the new owners are serious about this business – that they’re going to eventually do something for their original MF market with the proceeds from the Lunar. Using high-margin products like the Lunar to support R&D for less cash-generating halo products, I like that idea. I’m going to choose to believe that’s what they’re doing. That of course assumes the Lunar is high margin…we can only hope that this is the case. I’m not sure why people are any madder about a Hasselbad-badged Sony than they were about a Hasselblad-badged Fuji. This company sold out loooooong ago. However, I don’t agree that choice of materials (plastic textured like CF and wood veneer) justify the price jump, not even close. And I think you’re dreaming with the suggestion that Hasselblad may have modified anything internal. Well, the H1 and XPAN bodies were fujis. I think the problem here is that it seems to be an unnecessary blinging. In some ways, I agree. I think the NEX-7 is a great camera, but it is not without its weaknesses. In the end I chose the OMD over the NEX-7 because of the missing touchscreen and IBIS. If Hasselblad had taken the chance to really improve on the NEX-7 (more buttons/dials, IBIS, touchscreen, no AA filter, tiltable EVF, the possibilities are almost endless) I think this camera could have been fantastic! Even at a price that high, because I don’t think Leica offers that much more. Maybe Hasselblad will improve the firmware, but apart from that all that’s left is a new design that might be more comfortable (though the new dials look much worse to use) and certainly is much more ugly. To my eyes the NEX-7 features a beautiful, very modern design. The only things in that design that could have been better are the recessed dials (the area where your finger can contact them is a bit small IMO) and the grip (it feels good in my hand, but it could have been shaped more ergonomically). Unfortunately, the Lunar seems to abandon the original design for the most part and alter it in a questionable way. 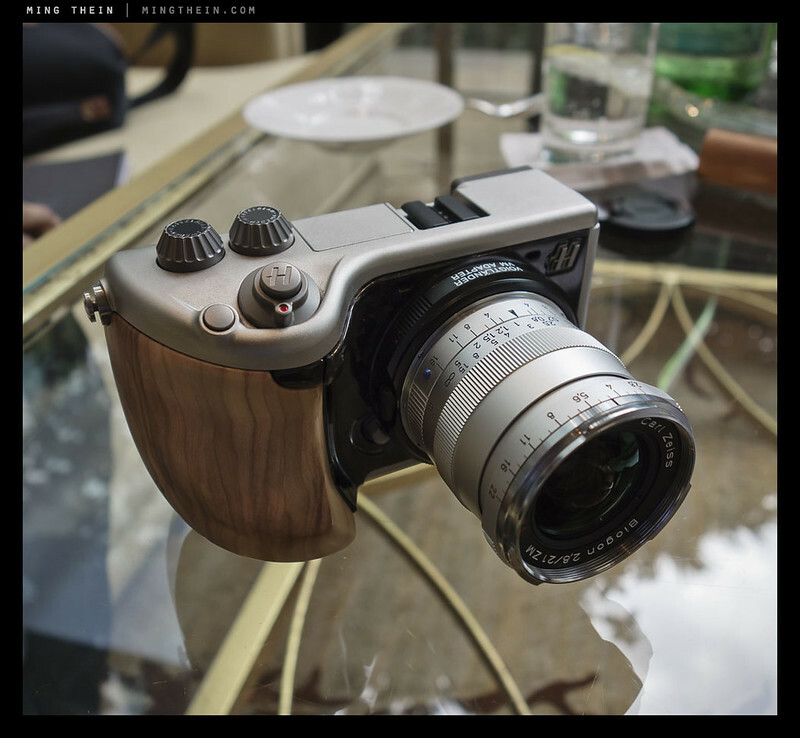 So I have much more hope in a NEX-9 to improve on the NEX-7 than in the Lunar. The most positive attribute of the Lunar to me is that it strangely reminds me of 20.000 miles under the sea – it looks quite steampunky with those weird dials and the wooden grip. The only things missing are a few gears and an external light meter! I for one will be curious to see where they take this concept. The impression I was given was that this was a first experiment to see if the re-engineering was a viable option instead of developing from scratch; I was told once that apparently Leica wanted to put more differentiation into the Panasonics, but was stopped from doing so by some contractual issues. All the usual questions: Form vs function ? Prestige (perceived by some) over the common-or-garden variety? A tool or a toy? Take the Panasonic Leicas as an example, as you have done in this case. Even to my jaded eye they look better than the Lumix originals, but in doing so often lose out ergonomically to the point where people buy after market grips to replace the ones that exist on the original Panasonics already! I fail to see how that makes sense if your camera is an image-making tool, not jewelry or status object. I owned a Leica CM compact – still the only Leica, despite anyone’s refutations 😉 – that was made from real solid titanium and not plated or painted. The feel in the hand was beyond compare, like a high end watch, and the functionality was not compromised in any way by form over function. Most perfect camera I’ve ever held. Reminds me a lot of this. No compromise in function, no compromise in form. It is possible to do. Perhaps at an elevated price, but it can be worth it if it fulfills a whole set of basic human needs, beauty, sensuous pleasure in tactility and adds, not distracts, from the function for which it is made. The Hassy has the potential to be an ergonomic tour-de-force, once materials have been settled on, made more practical, and those blasted rubies…ok, enough with the rubies already 😉 Just please concentrate on the positives, and try not to turn it into the equivalent of a Hermes Leica. Craftsmanship doesn’t preclude functionality if applied correctly. Like the Ricoh GRD, handgrips in different materials? For different sized hands? Or functional reasons, such as non-slip – also useful here in the tropics. So much potential, lets hope it gets realized and doesn’t become a shelf queen, but a practical, beautiful and inspiring to use camera. It’s become a very grey area. There’s no question that it isn’t what you’d call a beautiful camera. But frankly, most of the modern pro bodies aren’t beautiful either; there’s a functional ugliness there that has a design integrity to it, and in that way, a beauty of its own. The Nikon F4S is the epitome of that, in my mind. I don’t know if the intended market will use theirs – they tend to be collectors rather than photographers anyway – but if I had one, I’d use it. (Then again, I use all my cameras, including the mint F2 Titan…) The problem is whether the price is going to be steep enough to put off serious photographers, and the frivolous ornamentation enough to not let it be taken seriously – damn those rubies. But I was also told that the intention of the designer was that the camera should have this tactile quality that makes you want to pick it up and hold it. I think they definitely achieved that. Coming from a different angle – I have often wished I had the engineering ability (or the money to pay ) to modify a camera like an Olympus E-P3 and build it into something like a Nikonos Calypso or at least a “ruggedized” camera to suit the watery and sandy conditions where I most want to use my camera, especially where a bulky, heavy under water housing is totally inappropriate. The RS flopped, I reckon, because Nikon went from the relatively compact Calypso “RF” form factor to a make an UW DSLR which was too big, too heavy as well as very expensive. And the deal breaker for me was that most of the lenses were not usable out of the water! The answer for me appears to be to craft a DIY housing and get some of my engineering friends involved – they’re the sort of people who don’t walk away from a challenge very easily. Good to hear that they got at least the ergonomic right. If it wasn’t the case, I would have felt sorry for Hasselblad. I do hope that they meet their sales target and that we’ll see things the other way around too, some Hasselblad technologies branded Sony… Getting Sony in the Medium format? why not…? but obviously with the price divided by 7 and a Sony standard workmanship. That is one ugly looking camera. But a powerful tool for those who really need it. Something in that price-vs-utility bracket absolutely has to hook people via the design, people won’t spend multiples for something that has better ergonomics and feels nicer but does not appeal to them aesthetically. In my view, 90% of Leica’s special editions go to people who just collect them and don’t use them for photography but I just cannot see that happening for the Lunar. I just cannot believe that people would want to be seen with the Lunar and that is again 90% of the appeal of luxurious goods. True. 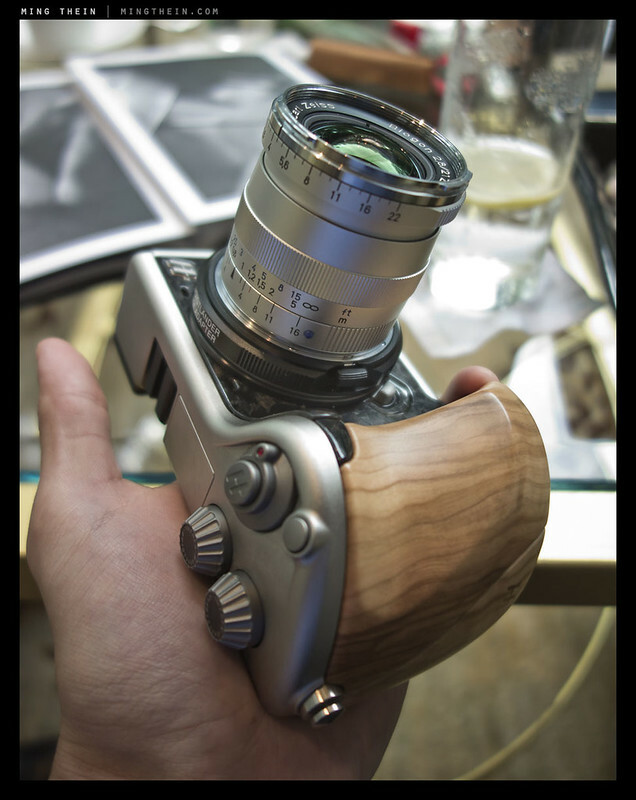 But I wouldn’t use a leather-gripped Leica, it would disintegrate in the tropics between humidity, rain and sweat. As for the Lunar…it looks a LOT better in person. I’d have made better product images if I’d known they’d be bringing one to the meeting, but I only had the RX100 which only macros at 28mm thus rendering completely the wrong perspective. How about this: I wouldn’t be embarrassed to use one. Talking about the rx100, I can recommend the Richard Franiec grip if you have not got one – it really makes the camera feel better in the hand..and makes it harder to drop due to it’s slippery surface. I’m with ya on the hand feel. I sent back my D800E without even unboxing it because I decided the D600 was a smarter choice for me. But before I ordered the D600 I went into a camera store and actually got my hands around one. Surprise! I didn’t care for it at all. It just didn’t work for me, and it seemed too light for my taste. I actually LIKE a substantial weight in hand. Now I’m regretting not at least getting the D800E out of the box. The good news is, I learned something from all that. I’ll never again contemplate buying a camera without first checking it out in person. Maybe I’ll end up going Canon–or something else–solely for the ergonomics, all other things being essentially equal. Dump the rubies and other foo foo stuff. 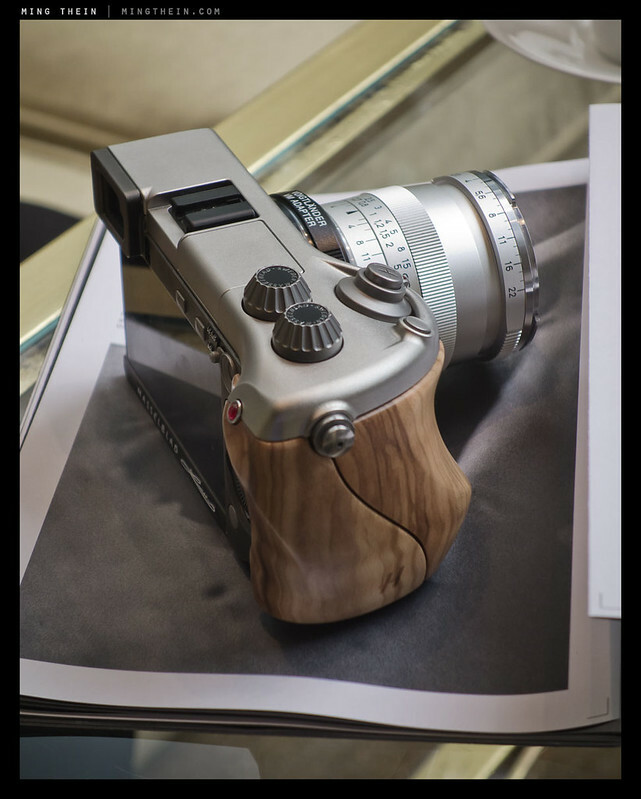 The ergonomic shape, wooden grip surface, clean functional dials and buttons … I have no problem with that. What lenses is the more important issue, as I dislike focus by wire AF lenses in general. If I was to have one, I’d probably either use it with the native E mount glass for wides, or ZF.2 + adaptor for teles. I, for one, would love to take it for a test drive. As far as the superfluous rubies…they just confirm my suspicion that the merger between traditionally separate electronic/photographic media and inessential consumer baubles is accelerating. But, we have seen this before, in the ‘Golden Age” of largely handbuilt coaches that evolved into beautiful and still functional automobiles. Cars may be more dependable and functional than in the 1930s, but I dare anyone to say a new BMW has a more elegant interior than a Dusenberg, Packard, Bugatti…etc from that era. Leather, wool, metal, ivory, (even bakelite), vacuum tubes, and luxurious loomed materials came together in unexpected and unprecedented ways. Art and technology were wedded. Industrial designers created real, and functional art. …. We do nobody, particularly the designers and the companies funding them, a favor by being narrow-minded. So, let the games continue on their arc, and let us handle these items before we condemn them. hmm, the embodiment of esoterica, with cosmetics that approach grotesque…but the more i look at it, the more this alien contraption intrigues me. what a bold move! i hope hassy sells a boatload of them just for having the balls to produce it.